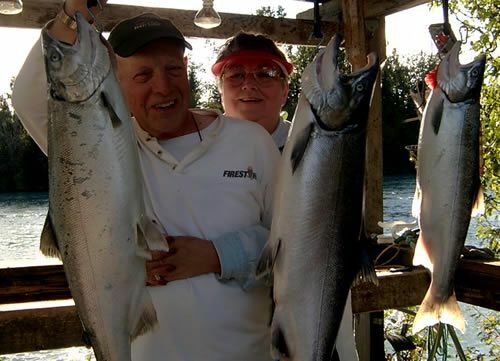 Here's what our "Happy Campers" are saying about their stay at Kenai Riverfront Resort! All comments come directly from our Guest Book or from emails we've received from guests after their stay. We're always happy to provide references to new customers, simply send us an email or request them when you submit your Reservation Request! 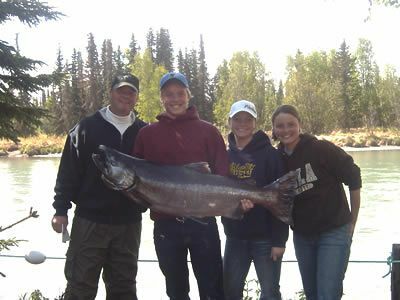 We hope this information will help you in your decision to stay, fish, and play at Kenai Riverfront Resort! READ What Our Happy Campers are saying on Kenai Riverfront Resort on Google! READ what our Happy Campers are saying on Kenai Riverfront Resort on Trip Advisor! 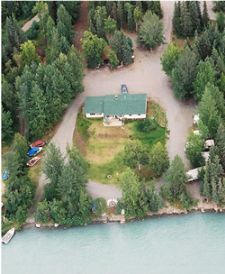 We've been Kenai Riverfront RV campers over several years and we think it is undoubtedly one of the best RV resort on the river. The red fishing is awesome and you're within easy easy reach by boat of the great kings holes. This resort is also convenient to local services. Jim & Cindy & their kids have made this a wonderful family oriented resort from sing-alongs around the campfire to international volley ball games and special occasion pot-luck fish fries. 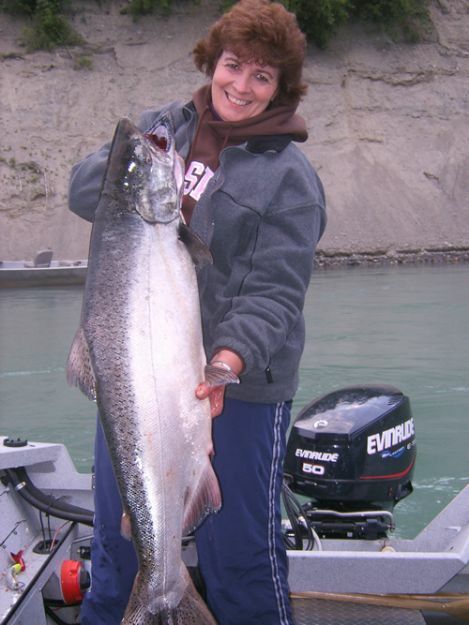 Kenai Riverfront Resort is truly as enjoyable as you wish to make it! "...this has been the best vacation ever! We leave with tears in our eyes, 4 coolers full of Reds, Kings and Halibut...This has surely been our "dream vacation" come true!! (Your family being a big part of it.)" "...Thank you so much for the wonderful (but way too short!) stay here at the Riverfront! This was our first B&B stay and we were not too sure what to expect. You have DEFINITELY set the standard high in our minds! The view is incredible, the beds nice, warm & comfy and the atmosphere relaxing & friendly. If we are ever blessed to be back in this area again, we will most certainly be back HERE! By the way, the breakfast was awesome! " "...Cindy & Jim, Thank you both and your family very much for the hospitality! Your Riverfront Suite and property are gorgeous! Thank you from the deepest of all of our hearts. May the Lord bless your family to the fullest...our experience here was one in a lifetime. Hope to see you again soon." "...Jim & Cindy, Thanks a million for the wonderful hospitality. Your smiles and warm generosity are what keeps me and my family coming back! 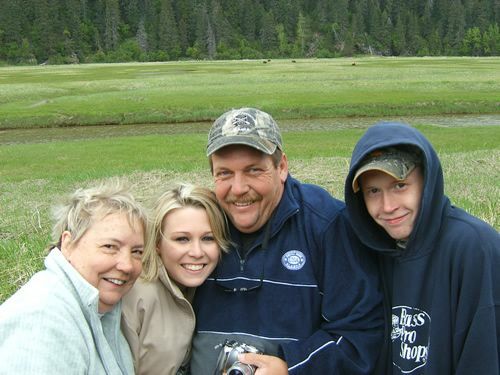 Look for us again as we continue our travels throughout Alaska, keep in touch..."
"...Dear Jim & Cindy, We couldn't have asked for better hosts and location, hospitality and new friendships--from the outstanding food and fun...it was a great way to celebrate our 5th anniversary. The restful contentment we experienced here was much needed and enjoyed. You all as a family work so hard and well together to make everyone's stay as a vacation to remember...we take home some salmon but most importantly some everlasting memories. Thanks so much." "...Jim & Cindy, I appreciate your hospitality. I didn't expect to such great service. It's real wonderful your Riverfront Suite!! I love sauna. It made me heal & relax. It was "Gokuraku, Gokuraku" which means "Heaven"! Thank you for dressing a salmon. Your skill is kind of Japanese Sushi craftsman!! It was nice exploration. Besides you made us smoked salmon...it might be great fabulous memory in my life! Thank you." "...Cindy, Jim & Kids, Thanks so much for your hospitality. The kids had such a lovely time together--you are a very warm & inviting family. We had a nice time on the river too...we saw eagles and even a moose swimming across...such a far cry from our hectic lives in Los Angeles, where we're surrounded by cars and mini malls. Thanks again!" "...Jim, Cindy & Family, Thank you very much. We could enjoy the first Alaskan Salmon here. The beautiful river, trees, winds, sun and your family made us happy!! We would like to come again and tell my friends...thank you very much for your kindness, we delighted to come and meet you." "...Jim & Cindy, Thanks so much for a wonderful trip. On such a short notice you were able to put together some awesome charters, and your knowledge of the water and local fishing was second to none. The hospitality the Nelson family provides is like visiting lifelong family friends. Thanks so much and I'll be sending friends and coworkers your way!" "...Dear Cindy, Jim & Family, Thank you so much for making our stay on the Kenai Peninsula such a wonderful experience....thanks for arranging the great flightseeing trip over the glaciers and the landing on the beach to view Alaska Brown Bears...how many people will ever be so close to more than a dozen Alaska Brown Bears! We'll be back someday. ..This was the greatest vacation I ever had and alot of it was because of you! You have a great place with great food and a great family. " 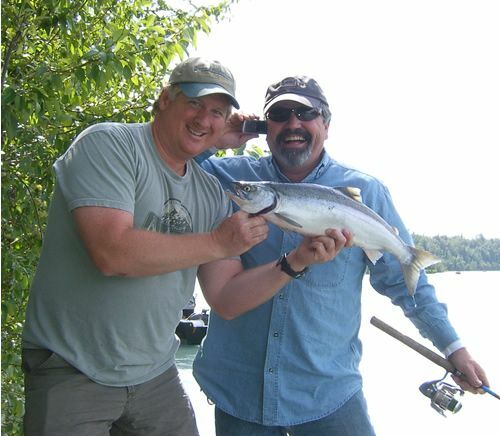 "...it is so great to be back at Kenai Riverfront again. As always, the setting, the hospitality, and the food were beautiful, gracious, and delicious...the meals can't be beat. The suite affords a view of the river and quiet for a good night's rest. We thoroughly enjoyed ourselves. Thank you." "...Jim, Cindy & Kids! Wow! What a fantastic way to spend our 9th wedding anniversary--here with you on the Kenai River! The cookouts, the s'mores, fishing and drifting were all so enjoyable, and the kids are a delight! Thank you so much! We will be seeing you again! " Jackie Purcell & Dannie Pearson, Anchorage, Alaska. "...Jim & Cindy, I’m finally taking some time out to send out a letter, thanking you and your family for the great time we had this last summer.My family, (including the folks) enjoyed every moment while staying at your place. The atmosphere was, relaxing and enjoyable throughout the whole time we were there. If Jim only knew how much I appreciated having a BBQ while camping, he would make it a center piece in his advertisement. The evenings were so relaxing just sitting around with the folks and visiting, while taking the kids out on the banks fishing and being able to spend some quality time with them. Your culture of safe camping, brought a sense of comfort to Mary and I, especially because of our two young children. We have traveled to many a “fish camp” during our vacations in Alaska, and have always had to put up with other campers that had no consideration of others, or concerns for safety. These qualities are recognized, and greatly appreciated. Not only was the visit to your place enjoyable, it was also relaxing! My folks both enjoyed themselves tremendously while they were there. Mom caught a 63 pound King, Dad pulled in a 45 pound King, and of course, we caught plenty of Reds from the shore." "...even though we're only spending one night in your Riverfront Suite, the time has been wonderful. Your home on the river is beautiful! Thanks for helping the guy from Brooklyn to catch his first salmon. He plans on being up early to fish before we leave in the morning. We've already discussed coming back next year and spending a few days with you..We'll get NY's famous Peter Luger Steak Sauce out to you as soon as we get home! Thanks again! P.S. 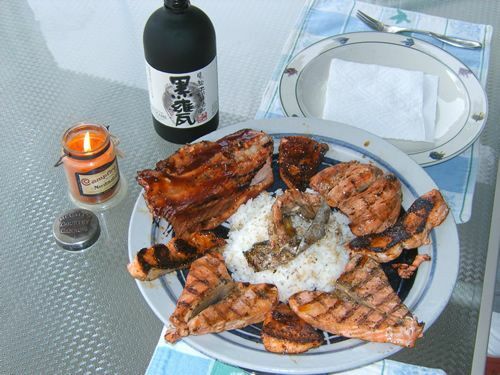 Brian loved his Japanese breakfast with his fresh caught salmon." "...our first Alaska experience and we could not have experienced a more professional, friendly and warm atmosphere. Great food, excellent fishing, and even the Alaskan weather was unbelievable! What a great environment to vacation in, you made our trip...thanks and hope to have the chance to visit with you again!" "...we were unexpected "drop-ins" and at the drop of a dime you took us in out of the rain! You have filled our cups with kindness...thank you...if you head south make sure to look us up and we'll take you down to the private sandy beaches of California! "May your best yesterdays be your worst tomorrows..."
"...I had a really wonderful time staying with you. 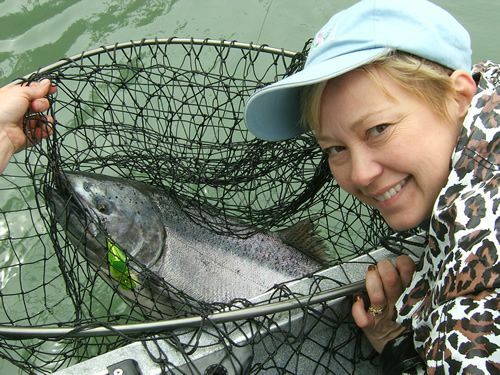 I had a chance to fish a big King Salmon and was really exciting!! I'd like to come back here again, hopefully soon...thanks a lot for everything...hope to see you soon!" 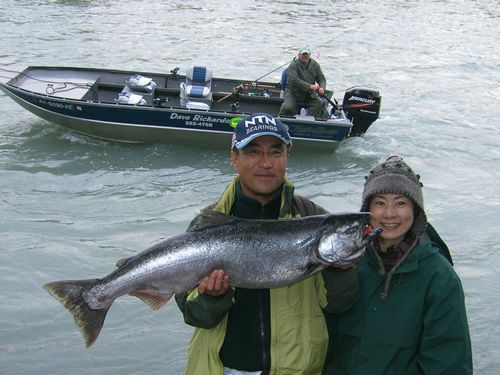 "...thank you for enabling us to have such a wonderful experience at the Kenai River. Your hospitality was great and your friendliness even more meaningful. I sincerely hope we can stay with you again, and we'll bring Mom with us next time too! We had a fun time learning how to cut and prepare Dave's 45lb King Salmon. Thank you for the delicious BBQ yesterday. We had a great time in our short stay becoming acquainted with your family...we hope to meet again!..." "...just wanted to let you know how much we enjoyed your RV Park last August. You and the kids made us feel like old friends or family. We hope we can return in the not too distant future. We made it home by September 5th with the freezer full of Reds and Halibut. A 150 lb Halibut from Homer filled the freezer to the top!" "...words can't express our experiences and time here with you on the "River of Dreams"~~Other places we call home, and its hard to head back to the reality of our home in Oregon, except this time it's the hardest, because we are leaving "big" pieces of our hearts behind...but we know we will always have a home to come to in Alaska..."
"...we have had the trip of a lifetime and we thank you so much for sharing your park and your lives with us. Meeting you and all the wonderful guests you have ahad here at the park has been a gift from God. What a blessing! Thank you and may God bless you and keep you and yours always..."
"...watashi wa koko ni kite Fishing ga suki ni narimashita. Japan niwa inai Big Fish ga takusan ite odoroki mashita. Kenai ni kite hontou ni yokatta...ii omoide ga takusan dekimashita! Thank you for everthing! Doumo arigatou...tanoshikatta desu!..." "...we loved our two nights here~~trying our hand at fishing for the first time, walking the beach in Kenai, eating wonderful breakfasts, chatting with locals, and singing by the fire! We got a real taste of Alaska life~~complete switch from Washington, D.C. We're now hooked on Red Salmon...Thanks for your warm hospitality..."